Dr. Vernon Huff is Director of Music at FFUMC, where he conducts the Chancel Choir and works with the Hannah Hasbrouck Petersen concert series. Dr. Huff is also Coordinator of Choral Activities at SUNY Fredonia, where he conducts Chamber Choir, the Masterworks Chorus, and teaches courses in conducting and music education. 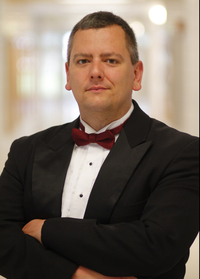 He received his DMA in choral conducting from Arizona State University, his MM in choral conducting from The Ohio State University, and his BM in music education from Furman University. Dr. Huff taught elementary and high school choral music for ten years. He lives in Fredonia with his wife Kate, and his sons Ethan and Alex.